Peter Hillary gave the keynote address at the 2003 Esri International User Conference. Among his extreme risk accomplishments, Hillary has climbed Mt. Everest twice. His most recent ascent came on May 25, 2002, when he was part of a National Geographic expedition commemorating the 50th anniversary of the 1953 climb of his father, Sir Edmund Hillary. Hillary spoke of his family's work during the past 40 years with the villagers at the base of the mountain. Sir Edmund and several friends set up the Himalayan Trust, which initiates projects such as building schools, hospitals, bridges, and other improvements for the Sherpa villages at the base of Mt. Everest. Today, there are 42 schools and hospitals located around the area. "It's been a wonderful experience for our family to go back to work with the local people who have given us so much in terms of the adventures and mountaineering expeditions," said Hillary. "While we need to look after people in need in our own communities, we need to think of people elsewhere around the world. This is an ongoing process, and with the help of the American Himalayan Foundation we've been able to give tens of thousands of people basic health care and education." He told the audience that after a person completes a project, it's important to not simply rest on one's laurels but to set new goals and challenges. He said, "Being forward-looking is uplifting and refreshing. The things that you plan for are what inspire you and refocus you. I believe it is important also to help others accomplish some of the dreams they have for themselves and their families. That is a truly rounded situation." Reflecting on the momentous accomplishments of others, Hillary said that 2003 is not only the 50th anniversary of the first Mt. Everest climb but also the 200th anniversary of the Great Survey of India. In 1803, a survey team set out to survey the whole of the Indian subcontinentthe greatest survey of its type at the time. That survey recorded Peak 15 as the highest mountain on earth. It was then named after the surveyor general, Sir George Everest. Hillary said that the conference audienceGIS professionalsdeals with extraordinary challenges all of the time. "We need to see [challenges] in the context of the big picturejust another step in the time of exploration, looking forward, and doing great things while taking advantage of what we've learned in the past. Summits are lost ground. They are brief successes, and you must see them for what they are. The process of getting there is the exciting, dynamic part and it is ongoing. There is no end to the challenge." Hillary is the author of five books including First Across the Roof of the World: The First-Ever Traverse of the Himalayas5,000 Kilometres from Sikkim to Pakistan and Ascent: Two Lives ExploredThe Autobiographies of Sir Edmund and Peter Hillary. His new bookIn the Ghost Country: A Lifetime Spent on the Edgeis to be published in January 2004 by The Free Press, a division of Simon and Schuster, New York. 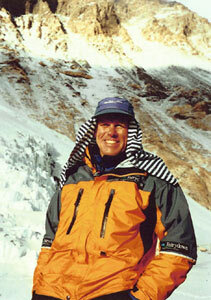 For more information, contact Todd R. Greene, Everest Speakers Bureau.com (tel. : 1-800-661-8859, int. tel. : 1-865-609-0231, e-mail: toddg@toddrgreene.com). Also visit www.himalayan-foundation.org. See also "2003 Annual Esri User Conference Honors GIS Professionals".